The goal of this initiative is to assemble an international network of scientists to train local researchers and assist them in the study of neglected Mesoamerican coastal marine biodiversity and the impact of climate change (e.g., via ocean acidification), specifically in Honduras, El Salvador, and Nicaragua. A cross-disciplinary approach that integrates taxonomy, molecular biology, and genomic techniques with biodiversity conservation will be used. This network will identify gaps in knowledge to determine the course of more in-depth research on the current status of marine biodiversity in Mesoamerica, leading to the development of collaborative programs on the sustainable use of marine resources and better understanding of anthropogenic influences on ocean biodiversity. The project will begin with the first International Conference on Central American Marine Biodiversity and Genomics to be held in Nicaragua. It will be followed by planning sessions and committee building to create an international network to develop a strategy for advancing marine biodiversity research and conservation in the region. The network will hold training and project development workshops during which students and scientists will be trained in sample collection, DNA sequencing, and data sharing, in addition to field training. The conference will present previously prepared discussion papers on priorities for research and the development of collaborative plans. Participants will discuss the scope and objectives, further training needs and outreach mechanisms, roles and responsibilities, expected development outcomes, data sharing, project sustainability, and funding. Sample collection and ecological evaluation at Pochomil, Nicaragua (Photo courtesy Dr. Huéte-Pérez). Team members analyze and discuss isolates (Photo courtesy Dr. Huéte-Pérez). This initiative expects to advance scientific and technical knowledge for informing development-related policies by building regional capacities on marine biodiversity and conservation, improve the capacity of local institutions, enhance the technical infrastructure of local, and impact the broader community in the region through partnerships between researchers, community leaders, authorities, educators and students. An asset of this project is the current pilot work of Dr. Huete-Pérez and his team in the Gulf of Fonseca, which is committed to fostering the “sustainable use of its marine and coastal resources and the integrated management of its ecosystems” through trinational cooperation. UCA has teamed with the European Union to work with communities in the Gulf to create a consciousness of the value of their marine resources. The expanded human resource capacity coupled with substantive advancement in the knowledge base relating to the coastal ecosystem will enable more appropriate public policies and decision making relating to the marine biodiversity coastal zones. The project will contribute to setting the stage for eventual commercial activities based on local stewardship of coastal resources and on diversification of the coastal economy. Using funds left over after the completion of their originally planned PEER activities, the Marine Biodiversity Initiative Project led by the Molecular Biology Center of the University of Central America (UCA) presented a PEER-funded training workshop on methods and bioprospecting for research on marine microorganisms in Managua Nicaragua, August 18-22, 2014. 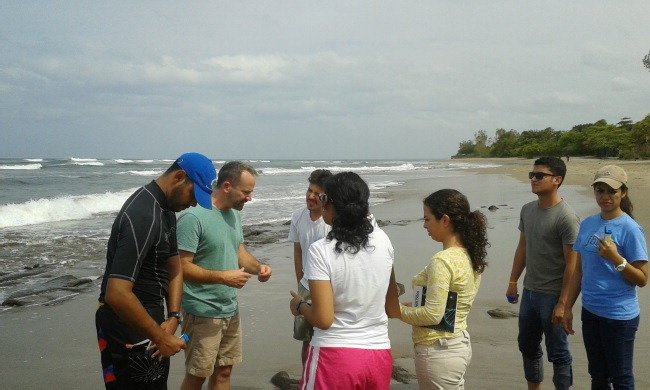 This week-long workshop held at UCA included a field visit to Pochomil, a sandy beach on the Pacific coast of Nicaragua. The instructor was Prof. Tracy Mincer of the Woods Hole Oceanographic Institution, an expert on marine microbial natural products and chemistry. Attendees included delegates from various Nicaraguan institutions, including the Molecular Biology Center (CBM-UCA), the Bluefields Indian and Caribbean University (BICU), the University of the Autonomous Regions of the Caribbean Coast of Nicaragua (URACCAN), and UCA itself. All of the participants work on projects directly or indirectly related to marine and coastal research. Some were students who will be starting their bachelor's theses addressing issues related to marine environments. Thus, the topics discussed during the workshop were of significant interest for all attendees. The workshop focused on methodological aspects of bioprospecting, with the main objective being to have a hands-on activity where the participants could learn by doing. The workshop included lectures on microbial natural products, microbial chemical ecology, and genetic identification of secondary metabolic pathways, but most of the time was spent in the laboratory, conducting several experiments. The course schedule allowed participants to collect different types of samples at the beach and work with them during the week. In the laboratory sessions, they learned to prepare culture media, use different lab facilities and equipment (for example, the autoclave, laminar flow chamber, dissecting microscope, and others), and identify algae and invertebrates. The focus was on obtaining microbial isolates from the collected samples. Participants prepared different media to culture bacteria, fungi, and endophytes that might produce secondary metabolites of interest for the biotechnology industry. 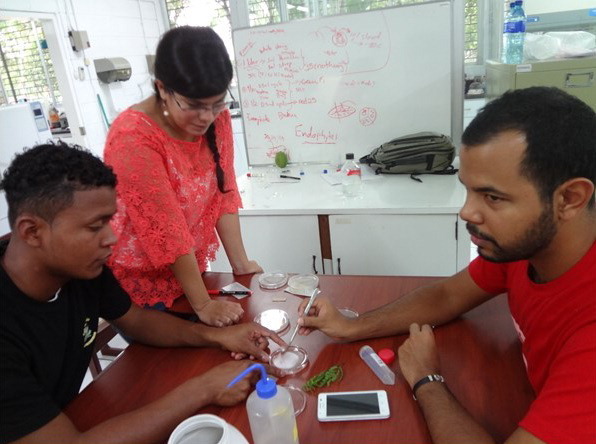 The workshop provided a unique opportunity for Nicaraguan researchers to learn more about bioprospecting and acquire entrepreneurial skills and new insights about microbial product preparation. Nicaragua is a country with highly diverse habitats, offering good opportunities to researchers interested in seeking and identifying novel natural products of biotechnological interest. As an initiative resulting from the workshop, UCA proposed the organization of a new research seminar series focused on marine conservation and bioprospecting. The aim of the seminars will be to provide an informal setting to discuss current projects, data interpretation, and future proposals. Thanks to a no-cost extension on the PEER grant through April 30, 2015, Dr. Huete-Pérez and his team will be able to carry out a few more training seminars and workshops and consolidate their outreach efforts by means of the Internet, stakeholder meetings, and other activities.